Over the last three years, except for the BVI Half Marathon, Rueben Stoby has dominated the local road racing scene, earning successive 2 miles, 5K and 10K victories on both Tortola and Virgin Gorda. He always found a way to outmatch his rivals. This year however, has been quite different. Stoby’s 3-year race dominance on Tortola came to an end during Saturday’sBlenheim Trust 5K Series tour of Tortola stop in Carrot Bay, when he was overhauled by debutant Clif Struiken over the last 800m, who went on to win in 18 minutes, 17.0 seconds. 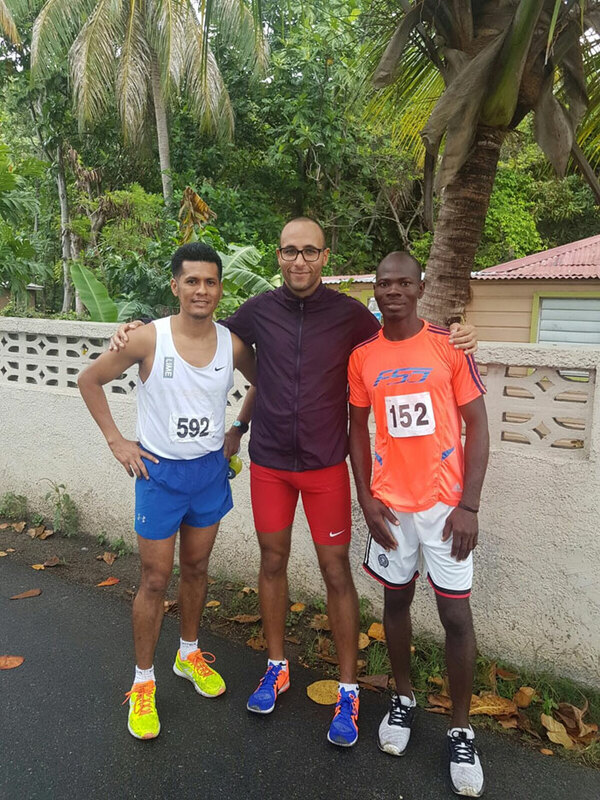 It was Stoby’s second successive setback after Virgin Gorda resident Vincent Fournier sealed the Dive BVI 5K Series there on March 18, winning that race in 17:38 to Stoby’s 18:49. Fournier who snatched Stoby’s title, also bested Stoby in the opener, 18:18-18:20. Julius Farley, 18:44.4. 4. Matthew Harkness, 19:34.2. 5. Paul Mellon, 19:58.8. 6. Jacques Roux, 20:24.0. 7. Guyp Dubois, 20:43.3. 8. Zebalon Mclean, 20:53.89. Colm Rafferty, 20:56.6. 10. Brad Goggin, 20:57.7. Women: 1. Katrina Lindsay, 20:57.7. 2. Rebecca Paull, 22:51.5. 3. Kim Struiken, 23:06.8. 4. Rosmond Johnson, 25:07.2. 5. Sarah Harkness, 25:40.7. 6. Kay Reddy, 26:35.9. 7. Debbie Bell, 26:37.6. 8. Krystal Blackman, 26:48.9. 9. Patricia Snoei, 27:08.8. 10. Karrina Stead, 27:15.9.